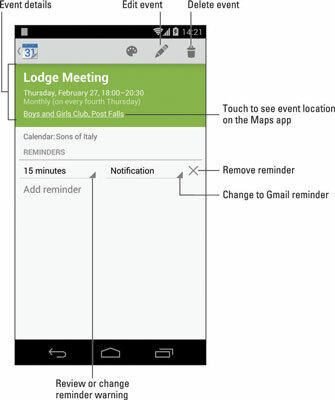 To see more detail about an event in the Calendar app on your Android phone, touch it. When you’re using month view, touch the event’s date to see the week view. Then choose the event again to see its details, similar to the event shown here. The details you see depends on how much information was recorded when the event was created. Some events have only a minimum of information; others may have details, such as a location for the event. When the event’s location is listed, you can touch that location, and the Maps app pops up to show you where the event is being held. Touch the Back icon to dismiss the event’s details. Birthdays and a few other events on the calendar may be pulled from the phone’s address book or from some social networking apps. That probably explains why some events are listed twice; they’re pulled in from two sources. The best way to review upcoming appointments is to choose the Agenda item from the View action bar. To quickly view upcoming events from the Home screen, slap down the Calendar widget. As in agenda view, the widget displays only a list of your upcoming appointments.